Daughter of (8.61) and Ber (8.20). 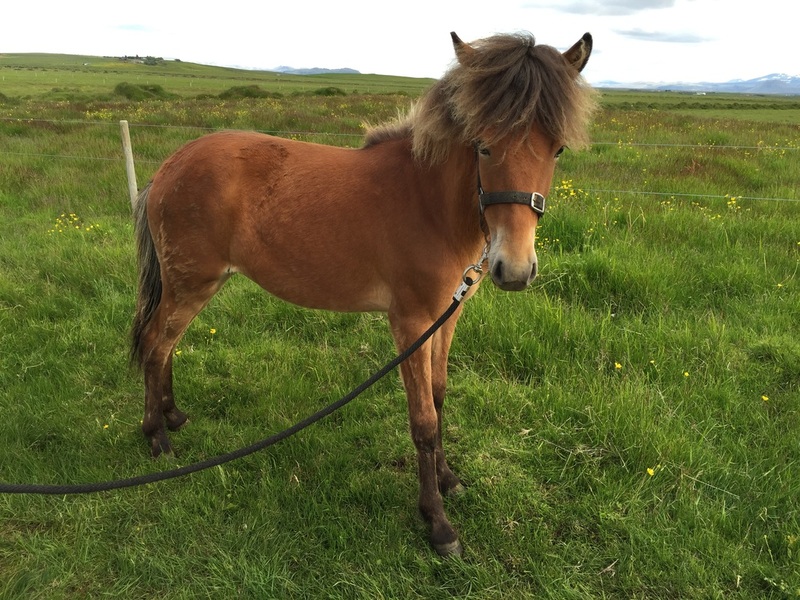 Coco frá Heimahaga is a promising mare, daughter of Gnýr frá Árgerði (8.02) and Edda frá Egilsstaðabæ (8.55). Konsert frá Korpu (8.61) is a great stallion with 8.41 for Conformation and 8.75 for Riding Abilities; 9 for tölt, 9 for trot, 8.5 for pace, 8.5 for gallop, 9 for spirit, 9 general impression and 7 for walk. Total 8.61. Konsert has also 9 for slow tölt and 8 for canter. Konsert is son of Sær frá Bakkakoti (8.61) and Hátíð frá Hellu (8.03). 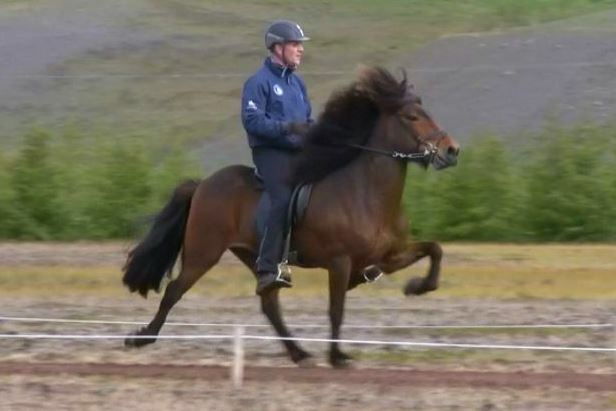 Sær frá Bakkakoti (8.62) has 7.96 for Conformation and 9.05 for Riding Abilities; 9 for tölt, 9 for trot, 9 for pace, 8.5 for gallop, 9.5 for spirit, 9 general impression and 8.5 for walk. Total 8.62. Konsert has also 8.5 for slow tölt. At Lansmót 2006, Sær got 1. price for his offsprings. and again at Landsmót 2008 he got honorary award for his offsprings. Hátíð frá Hellu (8.03) has 7.93 for Conformation and 8.13 for Riding Abilities; 8.5 for tölt, 8 for trot, 7.5 for pace, 7.5 for gallop, 8 for temperament, 8.5 for character and 8.5 for general impression. Total 8.03. 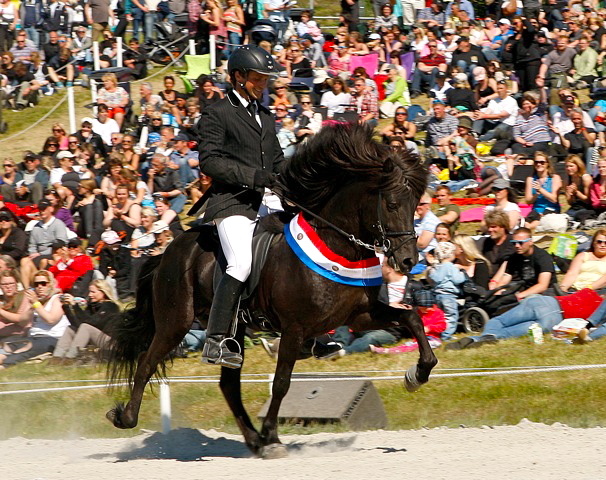 Hrymurfrá Hofi is a four gaited stallion and has 8.16 for Conformation and 8.23 for Riding Abilities; 9 for tölt, 9 for trot, 9 for gallop, 8.5 for spirit, 9 for general impression and 6.5 for walk. Total 8.20. Hrymur has also 8.5 for slow tölt and 7.5 for canter. Bjarklind frá Húsavík has 7.72 for Conformation and 8.37 for Riding Abilities; 8.5 for tölt, 8 for trot, 8.5 for pace, 7.5 for gallop, 9 for spirit, 8.5 for general impression and 7.5 for walk. Total 8.11. She has also 9 for slow tölt and 7.5 for canter.